Papaya fruit is known for its several nutritional, digestive, and medicinal properties. There are many different varieties of papaya, that all have distinct size, color and shape but in most of the varieties this pear-shaped fruit contains many black seeds, encased in a mucin coat, in the hollow central cavity. The flesh is orange in color with either yellow or pink hues, soft in consistency and has a deliciously sweet, musky taste with rich flavor. Papaya fruit is a rich source of antioxidant nutrients such as carotenes, vitamin C and flavonoids; vitamin E, vitamin A, the B vitamins, folate (vitamin B-9) and pantothenic acid (vitamin B-5); and the minerals, potassium and magnesium. In addition, it is also a good source of dietary fibers. Antioxidants in papaya help slow down the aging process by fighting against he skin damaging free radicals. The leaves and seeds of papaya tree are used to cure intestinal problems and kill intestinal worms and parasites. Papaya fruit contains several skin benefits and pulp of this fruit is often used as a basic component of many facial creams, lotions and face masks. 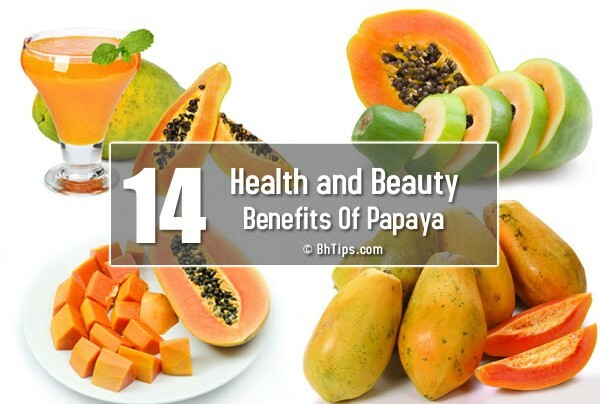 Let's have a close look on Best Health and Beauty Benefits of Papaya Fruit. High fiber contents in papaya helps to convert homocysteine (a harmful substance that can damage the blood vessels and cause heart attack) into amino acids that the body can easily process. Papayas are also loaded with some antioxidants that prevent the oxidization of cholesterol. If the cholesterol gets oxidized, it can build up plaque that can block the artery walls and eventually cause a stroke or heart attack. In addition, the efficacy of papaya fruit also to maintain a healthy circulatory system and heart because they contain folic acid which can eradicate these harmful substances damaging the walls of blood vessels that cause heart attacks. Papaya, contain zero cholesterol, and the high content of fiber will also help lower high cholesterol levels. Anti-oxidants and fibers in Papaya fruit, prevent the oxidation of cholesterol in the liver and lower cholesterol levels automatically. Lower levels of cholesterol in the blood, reduces the risk of stroke and heart disease. The antioxidants such as Vitamin C, E and beta carotene, found in papayas help in the destruction of cancer-causing cells.Papaya contains good amount of dietary fibers and antioxidants that help to flush out the harmful cancer- causing toxins present in the colon; as a result it prevents the body from developing colon cancer. Due to the high water content, ease of digestibility and high content of soluble fiber, this allows the proper functioning of bowel movements and helps to prevent constipation. The fruit is low in calories so it is ideal for people going on a diet. A 100gm of papaya fruit will give you 39 kcal. So by consuming papayas you can fill your body with large amount of nutrients but very low amount of calories. The enzyme called arginine found in papayas is known for boosting male virility, it increases the blood flow to the genital organs and proves very effective in treatment of erectile dysfunction. Digestive disorders can be effectively treated with the help of papayas. For individuals with pancreatic conditions or cystic fibrosis, chronic indigestion and bloating, papain enzyme present in papaya can be very helpful in preventing and curing them. Eating papaya fruit is believed to increase your body's immunity against disease. High content of Vitamin A, Vitamin B and C are needed to improve the immunity.Thus, diseases caused by decreased immunity such as coughs, colds, flu and infections can be prevented by eating papaya fruit. Hypertension (high blood pressure) is a major risk factor for stroke, congestive heart failure, kidney disease, and heart disease, which is responsible for 1 in 4 deaths in America. High potassium content in papaya helps keeping the blood pressure in check and prevent from hypertension (high blood pressure). Papaya contain an excellent amount of Vitamin A and flavonoids like beta carotenes, lutein, zeaxanthin and cryptoxanthins.All theses elements are essential for good vision and also require for maintaining healthy mucus membranes. Recent studies proved that papaya leave extract help bone marrow to rapidly increase blood platelet production. Papaya leave juice also help a lot to get relief from dengue fever. Papaya fruit is considered very effective to premature aging by helping the body to digest food properly. When the body properly digests all the nutrients needed by the body, then the body will be healthier and organ functions will run smoothly. Antioxidants present in papaya prevent free radical skin damage and prevent premature wrinkles and fine lines. Due to lots of skin benefits papaya flesh is used in various skin masks. Papaya skin mask helps to dissolve the dead skin cells, giving fresh, healthy and glowing skin. Papaya also help a lot to get rid of acne and skin infections as it helps to open clogged pores. (i). If you are allergic to papaya, avoid eating them because they can cause swelling or itching of the face, lips, tongue and throat; rashes that appear shortly after consumption; dizziness; difficulty swallowing; and abdominal pain. (ii). Pregnant women should avoid eating papaya because it can induce labour pains and may result in excessive bleeding or miscarriage. Papaya fruit (Carica papaya), Fresh, Nutritive Value per 100 g.